Our community must commit to turning values into actions in our policies, practices, and daily interactions. 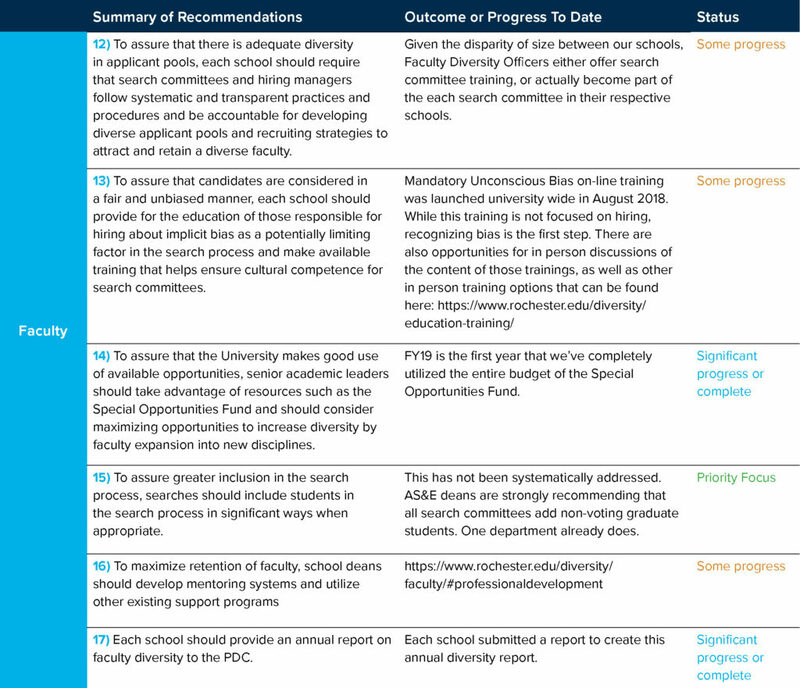 The report that follows identifies areas of progress and many of the resources that exist across the University to support diversity and inclusion efforts; the appendices highlight particular events and accomplishments of the past year, including our progress in responding to the Commission on Race and Diversity recommendations. Although we know that much work remains to be done, we are making strides in fulfilling our commitment to strengthening diversity, inclusion, and equity at the University of Rochester. Strengthening the University’s efforts in diversity, equity, and inclusion has been among my highest priorities since my appointment as interim president earlier this year. 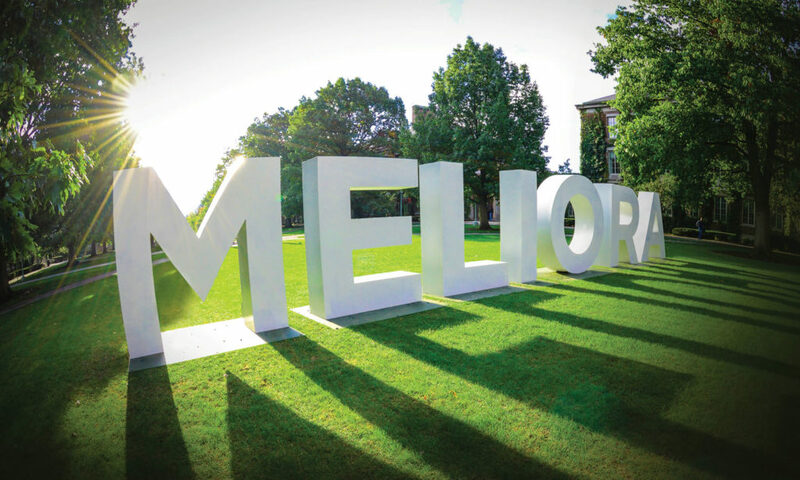 I said in my first message to the University community that I believe we can draw strength from our shared commitment to the ideal of “Meliora.” We strive to create a culture where everyone feels welcome, respected, included, and valued. In the past several months, the University has taken steps to improve aspects of our climate and build a culture of respect. In support of that mission, the University is strengthening policies, clarifying processes, expanding resources, and responding to recommendations detailed in the White Report and the Commission on Women and Gender Equity in Academia’s report. But the process of change necessarily requires more than rewriting policies and creating new administrative offices and positions. These are important steps forward, but to truly achieve our aspirations, our community must be unified in continuing to embrace a vision of our expectations for diversity, equity, and inclusion—and of what we as a community stand for. 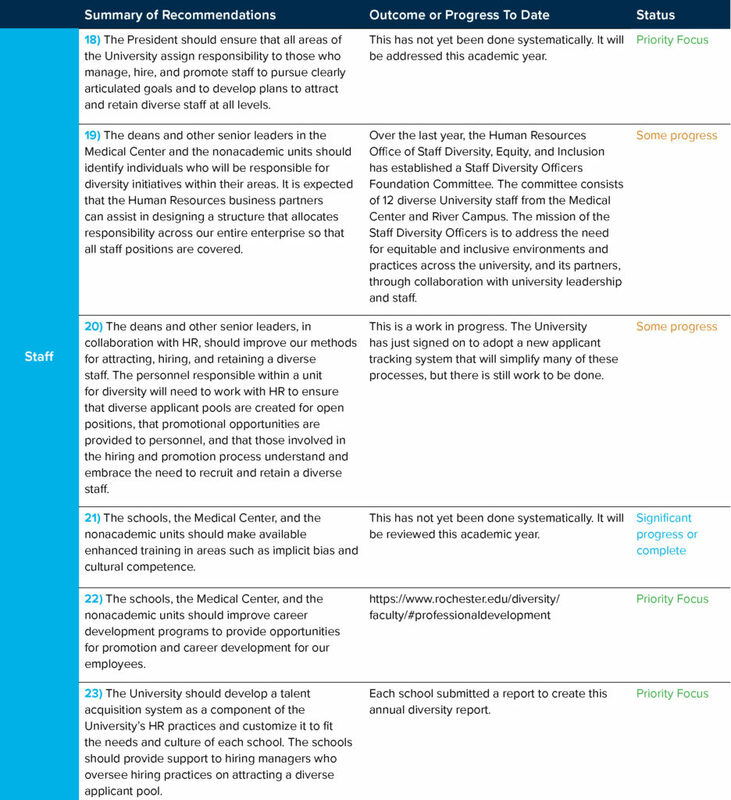 Our new Vision and Values Statement, reflecting input from all corners of the University, serves as a foundation for that process and is designed to work with already established school and department efforts, such as URMC’s ICARE and the College’s Communal Principles. My expectation is that our new Vision and Values Statement will help define our mutually understood values and provide a template for the ways in which we work and interact. As we make progress toward these mutual goals, we will draw on the substantial body of work created by the Commission on Race and Diversity in 2016 as well as two groups that issued reports in 2018, the Commission on Women and Gender Equity in Academia and the Student Task Force to Review Sexual Misconduct. A significant factor in the continued success of these ongoing efforts will be the establishment of a University-wide Office of Equity and Inclusion and the appointment of a Vice President for Equity and Inclusion, who will be the University’s chief diversity officer. I have just launched a national search for that position. That individual will report to a new University president once that individual begins work, which is expected to be July 1, 2019. This year our community lost a dear friend and champion of diversity and inclusion efforts on campus and beyond. Paul J. Burgett—musician, scholar, teacher, and University leader for more than half a century—leaves behind a legacy of valuing every individual and committing to the ideals of our Meliora motto. The substantial impact he made here on so many levels will bolster our efforts to make our University more equitable and inclusive long into the future. As I have said before, the University of Rochester has an opportunity to be a model for other institutions, not just in the letter of our policies and procedures but in the spirit of our actions, measured by our respect for each other and our differences in a campus community that is safe and inclusive for all. Diversity, equity, and inclusion are grounded in the University’s core Vision and Values. Over the last year, Vivian Lewis, vice provost for Faculty Development and Diversity and deputy to the president, chaired a 13-member committee of faculty, staff, and students that crafted a new Vision and Values Statement for the University. The committee made a concerted effort to incorporate feedback from the University community while developing the statement, including in-person sessions on campus and an online feedback form. This Vision and Values Statement works in dialogue with the Medical Center’s ICARE Values and the College’s Communal Principles and other unit-based values statements. In the spirit of Meliora, the statement is intended to guide the institution’s strategic vision and to help set expectations and norms around a culture of respect for the institution. It is intended to be a guide for all members of our community as we go about our daily activities and a reminder of how we view and treat each other as members of a diverse organization. As a University committed to principles of inclusion, mutual respect, and civil discourse, we all must continue to do our part—individually and collectively—to ensure that our community is one where everyone feels welcome, valued, and respected. The Vision and Values committee, now chaired by Joan Saab, vice povost for Academic Affairs, and Maggie Cousin, assistant vice provost for diversity, has begun a process of implementation, jump-starting conversations in the University community about our shared institutional values, especially in smaller units and departments. These unit-level dialogues will create opportunities for real action and change to occur. 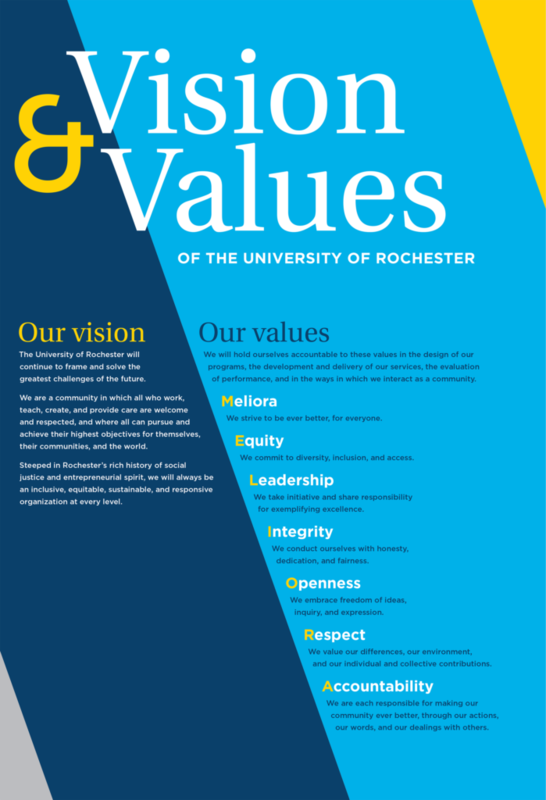 The Vision and Values Statement has already been rolled out at new faculty orientations and to the University Management Team and was highlighted at several venues during Meliora Weekend. As one of his first actions as president, Richard Feldman created the University Diversity and Equity Council (UDEC), a successor group to the Presidential Diversity Council and the Presidential Diversity and Implementation Committee formed in December 2016 following the release of the report of the Commission on Race and Diversity. The UDEC is a relatively large council composed of faculty, staff, and students from across the University, and its executive committee functions as an advisory group to the president and reviews recommendations and ideas coming from various sources around campus. The UDEC is charged to collaborate, share best practices, report on progress, and identify University priorities, goals, and requirements. Currently, President Feldman serves as chair of the UDEC. He anticipates the new Vice President for Equity and Inclusion, to be hired in the coming year, will lead the UDEC in the future. In its advisory role, this group has reviewed a number of significant actions of broad University consequence focused on diversity and equity. This past spring, President Feldman engaged DeEtta Jones and Associates, a nationally known consulting firm with specific expertise in workplace culture, diversity, and inclusion, to assess the University’s current diversity climate and programmatic resources; to make recommendations for a new University-wide equity, diversity, and inclusion office; and to draft a position description for a person to lead that office. Representatives of the firm visited campus three times between April and June 2018 to meet with key stakeholders, totaling seven days of in-person meetings, with an additional 5–10 hours of virtual meetings. Their time on campus utilized a qualitative research approach by incorporating onsite interviews and focus groups as well as comparative analysis of best practices at peer institutions. They stressed that to move forward, the University must take care to respond well to feedback from all members of its community. In response to the recommendations of DeEtta Jones and Associates, and with the full support of the UDEC, President Feldman is has launched a search for a new Vice President for Equity and Inclusion, who will be the University’s chief diversity officer and will report directly to the president. Given the urgency of creating this new position and office, the initial efforts in identifying a search consultant and launching the search for the new vice president will progress in parallel with the ongoing presidential search. We anticipate that the new president, once identified, will be involved in the final selection of the new vice president and chief diversity officer. The Vice President for Equity and Inclusion will oversee a new office consisting of two associate vice presidents, one focused on compliance (Title IX, Equal Opportunity, ADA, Affirmative Action, investigations), and the other focused on equity and inclusion (recruitment, retention, climate, programming, training, reporting, and accountability). To begin the work of bringing together the disparate units working in the area of compliance, President Feldman has asked Richard S. Crummins, currently deputy general counsel, to serve in an interim role as the associate vice president for equal opportunity. In this capacity, Crummins will report directly to the president, thereby moving this element of the University’s compliance function out of the Office of Counsel. Crummins has extensive knowledge and experience in these areas, having served in the University’s Office of Counsel since 1997. The second unit within the new office will be focused on recruitment, retention, support, and climate for faculty, staff, and students. Serving as its interim leader will be Maggie Kearney, vice provost and dean of graduate studies. She will serve as the associate vice president for diversity and inclusion and will lead University-wide initiatives in training, reporting, programming and conferences, and accountability. In this capacity, Kearney will also report to President Feldman. The Office of Institutional Research (OIR) is undertaking an analysis of gender-based pay equity (GPE) for nonclinical faculty at the University of Rochester at the request of Provost Robert Clark. The goal is to ascertain whether salaries reflect differences (on average) by gender when adjusting for several key factors such as rank, years of experience, discipline, chair positions, or endowed professorships. An earlier initiative was undertaken several years ago at the direction of the then dean of the Faculty for Arts, Sciences & Engineering, Peter Lennie, to examine GPE in AS&E. Looking beyond AS&E, OIR has set out to understand how we might conduct a broader, University-wide analysis for nonclinical faculty. Two avenues are being pursued. First, OIR attempted to locate external data for benchmarking and reached out to peers to understand what they are doing to assess GPE. Second, OIR is working in cooperation with a committee of faculty selected in conjunction with the Faculty Senate to select and implement models to evaluate our own salary data. For the second straight year, the School of Nursing (SON) received the Health Professions Higher Education Excellence in Diversity (HEED) Award from INSIGHT Into Diversity magazine. The award is the only national honor recognizing U.S. medical, dental, pharmacy, nursing, osteopathic, and allied health schools that demonstrate an outstanding commitment to diversity and inclusion. This section of the report aims to focus first on broad initiatives to improve climate, including the Office for Faculty Development and Diversity, some new initiatives around disability, and some detail about graduate students across schools and then moves into school- and unit-based reports. The mission of the Office for Faculty Development and Diversity is to help recruit and advance underrepresented minorities and women to the University faculty. The main tactic for accomplishing these goals is to work with deans and faculty diversity officers to implement strategies and support for the hiring, retention, and promotion of a more diverse faculty. The faculty diversity officers, two faculty members from each school nominated by their deans, work within each school to inform faculty searches, strengthen pipeline initiatives, assess progress, develop new programming, and raise awareness of the importance of diversity and inclusion. For information about faculty demographics, please visit the diversity dashboard. The Special Opportunities Fund remains an important resource for deans and department chairs who need additional support for recruiting and retaining a more diverse faculty. By supplementing available school resources, the fund has facilitated creating new faculty positions, dual career support, research funding, interdisciplinary work, and programming designed to promote a more inclusive climate. Since its inception in 2007, the fund has provided more than $5 million to hire or retain a total of 43 faculty throughout all seven schools. to hire or retain diverse faculty. The Special Opportunities Fund also provided bridge funding for the Gateways Music Festival at the Eastman School of Music, whose mission is to connect and support professional classical musicians of African descent. The fund has also built capacity for sustainability through other funding sources, including multiyear foundation grants and funds from the National Endowment for the Arts and the City of Rochester, and supported a Susan B. Anthony Center program focused specifically on finding new ways to reach other disenfranchised communities. The fund enabled the creation of a new handbook, Trans@Rochester, and also made it possible to support face-to-face training on unconscious bias in research and academic workplace settings to more than 900 staff, students, and faculty members. To supplement the recruitment and retention opportunities brought about by the Special Opportunities Fund, the Office for Faculty Development and Diversity also attends several recruitment fairs to meet individuals seeking faculty and postdoctoral positions. The office utilizes several database systems to expand the pool for searches across the institution, maintains an internal database of candidates who are interested in the University, and works to develop relationships at the Black Doctoral Network, the Chronicle-Vitae Recruiter, Higher Education Recruitment Consortium, the Registry, and the Southern Regional Educational Board. The Office for Faculty Development and Diversity also has built a suite of career development programs and large community events focused on educating and promoting dialogue in order to build an inclusive community. The Office for Faculty Development and Diversity continued to offer signature programs for faculty: UR Year One and Conversations with New Academic Leaders. This year, both were well received, with presentations by faculty, staff, and alumni given to more than 800 attendees. New this year, the Provost’s Office and the Office for Faculty Development and Diversity announced a fellowship program for staff and faculty aimed at building and embracing our diverse community. The Inclusive Climate Leadership Fellowship is a competitive two-year fellowship for staff and faculty who are passionate about incorporating diversity and inclusion into their careers at the University. The first cohort of fellows began work on their projects on July 1, 2018. Their projects reach multiple constituents and areas of the University; we expect to report on the results of these projects in next year’s Diversity and Inclusion Report. The Office for Faculty Development and Diversity sponsors a collaboration with the National Institutes of Health–funded BUILD (Building Infrastructure Leading to Diversity) Initiative, which includes Xavier University in New Orleans. The office partnered with Xavier to provide opportunities for students to do summer research at the University and for our faculty to collaborate with Xavier’s faculty. In 2018, two scholars came to Rochester as part of the Project PATHWAYS initiative. Chandler Golden worked with Dena Swanson of the Warner School, studying life event stressors among adolescents in the City of Rochester. Golden developed a research study where she plans to explore parents’ mental health and how it influences parenting African American/Black adolescents. Olivia Griswold worked with Elizabeth Handley of the Mt. Hope Family Center. Griswold studied child maltreatment, early childhood adversity, family dynamics, and poverty effects on child and adolescent development. The intent of this program is to encourage participants to consider returning to the University for their graduate studies. The Future Faculty workshop series, also sponsored by the Office for Faculty Development and Diversity, provides a means of connecting graduate students across the University to prepare the next generation of faculty and to give Rochester graduates and fellows a competitive edge in the academic marketplace. It offers information and hands-on experience with aspects of faculty life not traditionally part of the graduate curriculums, including innovative teaching, assessing learning, diversity and inclusion, and employing technology in teaching. The Office for Faculty Development and Diversity also includes the Susan B. Anthony Center, which works to bring awareness to and advocate for social justice and equality. The center’s work is conducted in the spirit of Susan B. Anthony, who fought tirelessly throughout her life for the betterment of disenfranchised populations. Center staff collaborate with the University community and partner with a wide range of local, national, and international organizations to fulfill the center’s goal of translating research into policy. This year, to further the professional development of the University’s faculty, the Susan B. Anthony Center partnered with the Office for Faculty Development and Diversity, the Office of the Vice Dean for Research at the School of Medicine and Dentistry, and the Textbook and Academic Authors Association to bring development coach Tara Gray to Rochester. Gray serves as an associate professor of criminal justice and as the first director of the Teaching Academy at New Mexico State University (NMSU). She gave two workshops: “Publish and Flourish: Become a Prolific Scholar” and “Ten Ways to Manage Your Time.” Both were well attended and well received by University of Rochester faculty and staff. The Susan B. Anthony Center also added new student engagement programming to its offerings this year. The Susan B. Anthony Center Ambassadors Program gives students the opportunity to volunteer in the Rochester community at nonprofit agencies, allowing students flexibility to volunteer to increase their civic engagement and community-building skills. 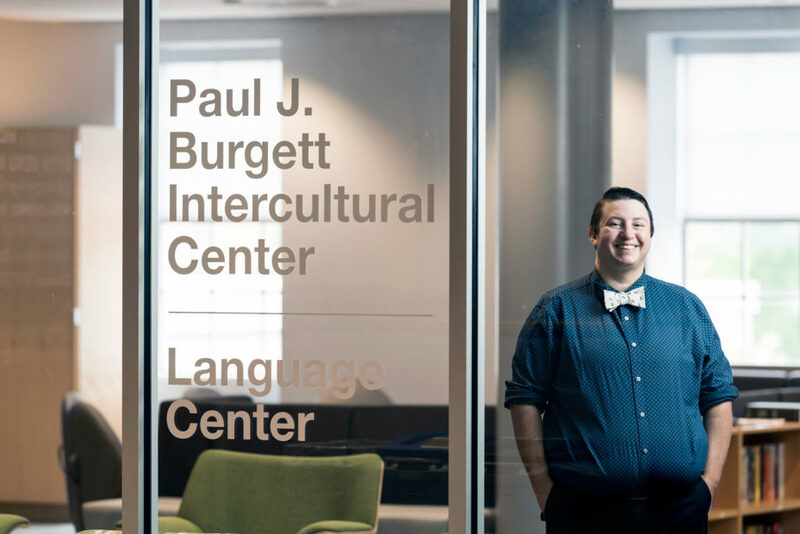 As a follow-up to the Trans@Rochester handbook, the Susan B. Anthony Center and student Bruno Sacatucua worked with the Office for Faculty Development and Diversity, the Office for Minority Student Affairs, and Admissions to create a Handbook for Underrepresented Ethnicities (HUE). This 37-page handbook was launched in October 2017 and has received overwhelmingly positive feedback from the University community. Student organizations focused on disability and Deaf identity at the University of Rochester have continued to grow and diversify over the last year. For example, one of the newest Students’ Association–recognized student organizations is Students for Chronic Illness Visibility, a group that has garnered notable support and participation among students in the College. Organizations not explicitly focused on disability in their mission have also sponsored and hosted programming focused on combatting ableism, demonstrating a commitment to and appreciation for disability issues among the wider student body. Undergraduate and graduate students with disabilities across the University convened a series of three advocacy meetings in the spring 2018 semester during which campus accessibility and disability-related concerns were openly discussed and captured. Students plan to share these insights and recommendations with University leadership in the fall of 2018, with the goal of pushing the campus toward greater accessibility and empowerment of students with disabilities. Services for students with disabilities are provided within individual schools. Each school has a designated access coordinator who requests and maintains disability-related documents, certifies eligibility for services, and determines and develops plans for reasonable academic accommodations. Over the last year, Arts, Sciences & Engineering moved disability services from within the Center for Excellence in Teaching and Learning to a stand-alone Office of Disability Resources at the College. Graduate students form the pipeline of future faculty, so increasing faculty diversity at the University (and elsewhere) depends upon enhancing graduate student diversity. These students will be in great demand as professors and mentors once they receive degrees. University master’s and doctoral programs have made headway over the past 10 years, but challenges remain. While international students and Asian students from the U.S. are fairly well represented in master’s and doctoral programs, Black, Hispanic, Native American, Pacific Islander, and mixed-race students are less so. Overall, the University has made progress over the past 10 years in increasing the percentage of entering graduate students who are underrepresented minorities, but STEM fields continue to face the most significant challenges. Each school or unit works to address its local climate in its own unique way; some of this work is described below. The deans of AS&E meet regularly on the broad topics of inclusion and equity, identifying issues that impact the climate for faculty, staff, and students and developing creative solutions for these challenges. 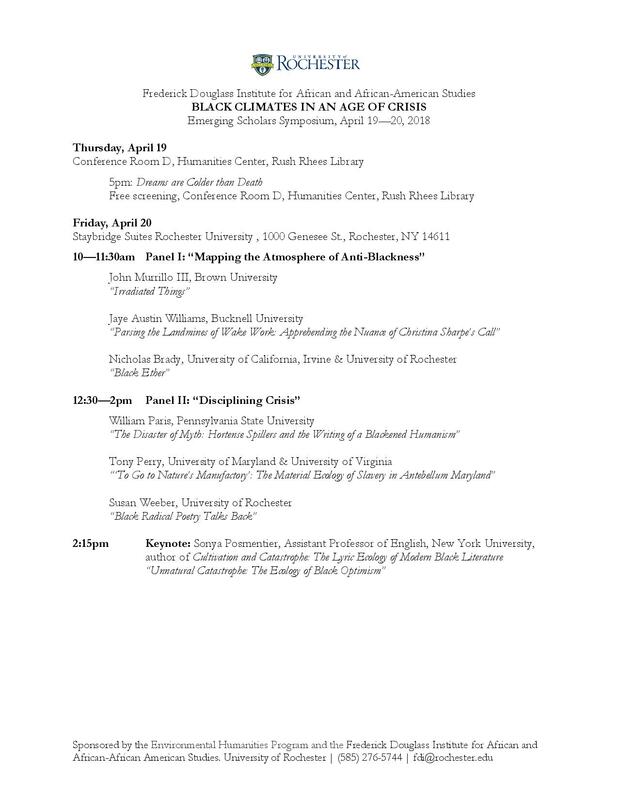 This year, meetings with the faculty associated with the Frederick Douglass Institute for African and African American Studies (FDI) and the Susan B. Anthony Institute for Gender, Sexuality and Women’s Studies (SBAI), as well as many other faculty in formal and informal groupings, uncovered multiple ways in which the climate could be strengthened. These include but are not limited to the need for a faculty ombudsperson within the school, a desire for a focus on faculty hiring to bolster both FDI and SBAI, issues that arise for many faculty when meetings extend past regular business hours, the need for accessible parking for faculty with specific short-term issues, and the lack of day care on the River Campus. The deans have addressed many of these, with the hiring of John Barker as senior associate dean of the faculty and faculty ombudsperson in AS&E, part of whose role is to work with the leadership of FDI and SBAI to raise their profiles, implementing a policy that requires business meetings to end by 5 p.m., ongoing discussions regarding creative parking solutions, and more. In addition, the role of AS&E’s dean for diversity, Beth Olivares, was expanded in January 2018 to give her more wide-ranging oversight of issues that impact the experience of climate for faculty, staff, and students. As part of ongoing work in AS&E, the deans are also reviewing all leave policies and family-friendly policies; reviewing all associate professors on an annual basis to determine their progress to full professor; and examining department, institute, and center leadership by gender. This academic year, the format of search committee trainings in AS&E changed to multidepartment meetings. Additional benchmarking data was provided to departments based on departmentally identified peer sets rather than a generalized set of peer data. Also new this year, when justifying the “short list” of candidates to bring for interviews, AS&E asked departments to provide information not just about the candidate’s research but also about other assets the candidate would bring to the department. The goal is to ensure that search committees consider diverse criteria and take a more holistic approach when evaluating candidates. AS&E also has resources available to help departments recruit diverse faculty, including support to attend the Compact for Faculty Diversity and leverage the AS&E Target of Opportunity funds. AS&E faculty are encouraged to seek outstanding faculty members who would add to the diversity of the department or school at any time. The deans encourage departments to advise them of unanticipated hiring opportunities that would greatly strengthen the department and AS&E as a whole, despite there being no approved search in the candidate’s discipline. The deans emphasize their willingness to make opportunistic hires at all levels that will bring AS&E exceptional faculty, including, but not limited to, faculty members from groups that are underrepresented in their disciplines. Several Target of Opportunity offers were made in AS&E in the last academic year. In the 2017–18 academic year, AS&E departments hired 19 new faculty, including 11 women. This is the greatest number of female faculty ever hired in AS&E in a single year, and for the first time more than 25 percent of AS&E faculty are women. of AS&E faculty are women. Arts, Sciences & Engineering has made significant strides in increasing the diversity of the undergraduate student population. The College deans continue to focus on the retention and graduation rates of first-generation college, low-income, and underrepresented minority students. Several donor-funded programs that provide financial, academic, and social support to such students have demonstrated a high level of success. The Office of Minority Student Affairs (OMSA) is the official academic home for historically underrepresented minority students, the Higher Education Opportunity Program (HEOP), and the Early Connection Opportunity (ECO) program. By offering a strong network of academic support, personal counseling, and substantial financial assistance, the five-year graduation rate for HEOP students who graduated in May 2018 was 89.6 percent higher than the overall College undergraduate graduation rate of roughly 86 percent. OMSA understands the importance of diversity within our student body and the larger campus community. In embodying the University’s desire to promote a diverse and inclusive climate, OMSA works with various student groups and organizations that are multicultural in scope. The collaborative work that OMSA carries out with campus cultural organizations promotes retention and persistence. The Douglass Leadership House (DLH), to which OMSA provides an advisor, is a residential academic learning center located in the Fraternity Quad. Students explore a broad set of topics related to academic and social life on a college campus and engage with non-DLH students through programming, social events, and unique course work. The David T. Kearns Center for Leadership and Diversity has substantially expanded support services for first-generation college students. As part of these efforts, Rochester became a Posse partner in 2014 and provides full-tuition merit scholarships annually to qualified students from the Washington, DC, area. The Posse Foundation was founded in 1989 to identify high school students with extraordinary academic potential who may be overlooked by the traditional college selection process. Cohorts of up to 10 high-achieving students are sent to selective colleges and universities, and the University of Rochester’s inaugural cohort of Posse Scholars graduated in June 2018. The One Community program, which just celebrated its fifth year, provides first-year students with a glimpse into the intersecting identities of six upper-class students, each of whom share a personal narrative. First-year students participate in small peer-facilitated groups to discuss and reflect on aspects of their own identities. This has been the most popular orientation program in recent years. But it is also just the start of One Community programming throughout the year that the Paul J. Burgett Intercultural Center organizes. AS&E has also established the One Community Programming Fund, which is designed to support culturally based programming and enhance the understanding and appreciation of diversity and inclusion initiatives. This year, the President’s office sponsored $25,000 in One Community grants, which were awarded to 27 diverse student organizations to help fund and support culturally based programming and to enhance the understanding and appreciation of diversity and inclusion initiatives. Through the Communal Principles Project, the College has sponsored $3,000 in minigrants for students to apply for when they have an initiative, program, or event that addresses the year’s highlighted communal principle. This year, funds were awarded to 10 diverse student organizations that promoted the concept of Respect on our campus. The director of the Paul J. Burgett Intercultural Center also receives and responds to bias-related Incidents. To support this activity, an advisory committee comprising the dean of the College, the dean of students, the dean for diversity, and the assistant dean and director of the Office of Minority Student Affairs meets regularly to review reported incidents. An annual report on the 2017–18 incidents and outcomes will be published to the AS&E community in the fall 2018 semester. The College Diversity Roundtable continues to meet regularly to address topics related to equity and inclusion that are of concern to the student body and to advise the dean of the College on such issues. Through the Kearns Center there is also focus on targeted recruitment of women and underrepresented minority students into AS&E graduate programs. AS&E now requires search committees for staff positions in grades 54 or higher to go through training on best practices and implicit bias, similar to the training done for faculty searches. Three sessions have occurred since May 2018. There is also a project to develop a data set regarding the ethnicity and gender makeup of AS&E staff by pay grade and job codes, to inform hiring and retention. This work will continue throughout the coming year. In AS&E, in the 2018–19 academic year, both academic and nonacademic departments will conduct surveys of their internal climates, and the College will again conduct a climate survey for undergraduate students to continue to monitor and improve the climate and culture within the school. The last survey was conducted three years ago. Over the last year, the University of Rochester Medical Center (URMC) has focused on enhancing learning and work environments and building infrastructure that includes multiple critical committees like the Respectful Learner Environment Task Force, Executive Committee for Diversity and Inclusion, the Clinical Cultural Competency Committee, Faculty Diversity Liaison Committee, Deaf Professionals Executive Committee, and a Structural Racism workgroup, among others. Individual departments are beginning to identify diversity and inclusion committees and/or specific individuals to lead these efforts with dedicated time. This is a critical step in aligning individual department efforts with the strategic vision and plan for URMC and the Office for Inclusion and Culture Development. In addition, ongoing experiential education—accessed both online and in person—is critical to changing URMC culture. URMC has implemented a series of educational sessions in a multifaceted approach; one-hour educational programs are provided via grand rounds and faculty and staff meetings to expose employees, learners, and faculty to the concepts of unconscious bias, privilege, microaggressions, and allyship. The programs also provide an introduction to available resources, such as CultureVision™, an online tool to help medical providers learn about different cultures and groups. In December 2017, the Department of Medicine began participating in a two-year National Institutes of Health study to develop infrastructure and sustainability of unconscious bias training through a train-the-trainer model. Other important educational initiatives include experiential learning to address issues with biased patients using the Theatre of the Oppressed technique and a monthly diversity series designed to help participants understand cultural perspectives that may impact patient care, education, and research. As part of the focus of assuring a respectful work environment in URMC, a task force appointed by the dean proposed a new Faculty Professionalism Council (FPC), which will support a culture of professionalism by articulating expected behaviors and providing educational initiatives to bolster skills as well as centralizing and standardizing reporting and remediation processes to address reported concerns. The proposal for this new council received broad support from faculty and institutional leaders as well as from staff and trainee colleagues. The FPC is forming now and will begin its work in the coming months. The School of Medicine and Dentistry also continues to provide unconscious bias training to senior search committees to assure a diverse pool of candidates and finalists. It is working to expand the training for the upcoming year. URMC conducts an employee engagement survey every 18 months. In 2017, this survey—which was originally focused around Strong Memorial Hospital employees—was expanded to staff throughout the Medical Center. In a follow-up to the survey, action plans were developed at the department level specifically focused on confidence in the organization as a whole, work environment, and perceptions of leadership. Incorporating feedback from the 2016 Diversity Engagement Survey, URMC has created a pilot initiative in one department to develop a best practice to respond to survey results. At URMC, Staff Forums will be held this fall featuring a combination of educational lectures and presentations with break-out sessions focused on diversity and inclusion. Also in the fall, a Leadership Series will include education tailored to hiring managers and supervisors with a focus on unconscious bias in the hiring process as well as building systems and processes of inclusion. The School of Medicine and Dentistry (SMD) continues to create a culture of diversity, equity, and inclusion from the admission process through to graduation through a number of initiatives, policies, and procedures. The percentage of students historically underrepresented in medicine (URiM) continues to increase due to the holistic application review process, mandatory implicit bias training for Admissions Committee members, and increased presence at diversity recruitment fairs. Of the Class of 2021, 21 percent self-identify as URiM, which is above the national average of 18 percent. As of July 3, 25 percent of the incoming class of 2022 self-identify as URiM. The gender make-up of the Class of 2021 is 53 percent female and 46 percent male. For the Class of 2022, 51 percent are female and 49 percent are male. URSMD developed the Meliora Professional Development (MPD) course, which is offered to URiM incoming students, to facilitate the transition to medical school. The two-week-long course gives entering students a brief but intense introduction to medical school similar to a prematriculation program. After one year it appears to have had a positive impact on the percent of students who were successful in the introductory course Human Structure and Function. A new Ombudsperson program is available to all preparatory and graduate program participants as well as to postdoctoral trainees. Three ombudspersons are faculty from three different departments and have been trained to help clarify policies and procedures and provide confidential, neutral, independent, and informal advice to help trainees address their concerns. The Office of Graduate Education and Postdoctoral Affairs also created a new director of enrollment position focused on PhD, master’s, and certificate program recruitment. The goals of the new role are to increase the inquiry and applicant pool with focused attention to the quality and overall diversity of prospective students. URMC also spent time this year focused on supporting graduate medical education training directors to better understand issues related to holistic review, culture, climate, recruitment, and retention of diverse residents and fellows. Adrienne Morgan, assistant dean for medical education diversity and inclusion, has ably supported the trainees as well as the program directors. Under her lead, the visiting clerkship program has expanded, and departments are now requesting these clerkships and are actively engaged with the program. The percent of residents and fellows from underrepresented groups in medicine has more than doubled in two years. In addition, URMC’s efforts have enhanced the University’s visibility nationally at the Student National Medical Association, a group committed to supporting current and future underrepresented minority medical students; addressing the needs of underserved communities; and increasing the number of clinically excellent, culturally competent, and socially conscious physicians. The Eastman Institute for Oral Health (EIOH) flourishes because of a wide range of backgrounds, ages, education levels, gender, abilities, and perspectives. For decades, Eastman Institute for Oral Health’s reputation has attracted dentists from around the world. Each year, about 50 percent of the trainees come from outside the U.S. This year, the number of countries the residents come from has jumped significantly to 39, compared to 24 last year. More than 20 percent of the U.S. citizens and permanent residents are from underrepresented cohorts. Fifty-three percent of EIOH residents and students are male, and 47 percent are female. EIOH staff exemplifies the diversity of our patient population. Greater than 1/3 of our staff are underrepresented minorities; 25 percent of staff leadership positions are filled by underrepresented minorities; and 100 percent of staff leadership positions are filled by females. An upcoming project with Action for a Better Community may provide opportunities for even greater EIOH staff diversity through a workforce development program that will train and mentor individuals interested in starting a career in dental assisting. In the end, educational takeaways are usually life changing and far exceed the formal education or position that was originally sought. The School of Nursing (SON) continues to assess the needs of faculty, staff, and students and find innovative ways to promote equity and inclusion within the school community. Several programs challenge SON students, faculty, and staff not only to think about how that they can improve equity, diversity, and inclusion in the school but also how to identify and confront the various ways that people unconsciously engage in practices that exclude others. The School of Nursing is also the first among the University’s schools to have established a student diversity officer role, designed to provide a direct link for students to be represented in the leadership of the Council for Diversity and Inclusiveness (CoDI). The members of CoDI include faculty, staff, and students from across the School of Nursing, and the council guides the continuing efforts of the SON community to create the most welcoming learning and working environment that reflects and values increasing diversity at the school. The council successfully recruited the inaugural student diversity officers, , two doctoral students who are underrepresented minorities. The SON is also launching a Dean’s Pre-doctoral Leadership Fellowship program, which identifies promising individuals from underrepresented groups and provides them with full tuition support and mentoring to complete their doctoral education in nursing. Over the last year, both Eastman School of Music and the School of Nursing have begun to focus on representation on their campuses. As the Commission on Women and Gender Equity in Academia report noted, the University must provide diverse role models for our diverse community—in person, on our walls, and in our communications. At Eastman, a new display case of materials related to diversity is in development. It will be located in Lowry Hall, the most public thoroughfare of the school. The School of Nursing has made significant strides to use various media platforms, including social, print, and online, to promote diversity, equity, and inclusion. The media platforms showcase the best of who and what the SON is as a school, communicating to internal and external audiences that diversity, equity, and inclusion are key to the School of Nursing’s identity. This year, the Eastman School of Music had a goal to increase faculty self-reporting of their diversity efforts in the annual Faculty Activity Reports. In the instructions for completing the 2017 reports, faculty were invited to describe their individual efforts to address diversity in their teaching and in their professional activities. The school also established an Eastman Diversity Award this year. These steps toward formalizing and recognizing diversity and inclusion demonstrate progress. At the Eastman School, the diversity committee acts as a coordinator, collaborator, and promoter of Diversity-related events and resources available at Eastman and on the River Campus as well as in the greater Rochester area. Eastman’s Student Activities Office continues to sponsor a program called Identities at Eastman during orientation to engage students in a conversation about diversity right from the start. The Diversity Committee at Eastman includes many active subcommittees that sponsor and plan big events, performances, academic lectures, discussion panels, student-driven events, and more related to and surrounding cultural, social, and academic diversity. Click here to learn more. Eastman’s faculty diversity officers met with multiple search committees to increase awareness of committee members about the importance of recruiting a diverse faculty and a change in Faculty Activity Reports. A group of three new faculty members sponsored a series of meetings for other faculty and for graduate students, focused on the topic of “engaging race in the music classroom.” The first workshop was attended by more than 40 people, and the leadership faculty group has proposed a new series of workshop experiences for the next academic year. Ranked as the tenth-most-diverse MBA program by U.S. News (June 2016), Simon Business School is dedicated to supporting the MBA and MS student experience by promoting diversity in graduate education and business. However, Simon still has a long way to go with diversifying their faculty and staff; this dichotomy is at the heart of the task ahead for the school. In the last year, the Simon School has overhauled its mission, vision, and principles statement, with a strong emphasis on diversity. Working with students, the school created a “Simon Strong” document for students to use as a guide to set classroom and campus culture. The school has also focused on providing implicit bias training for all student-facing employees. Simon’s Diversity Conference continues to grow and this year will celebrate the 50th anniversary of Simon’s participation with the Consortium for Graduate Study in Management. The consortium is an alliance of leading American business schools and some of our country’s top corporations with a mission of enhancing diversity in business education and leadership by helping to reduce the serious underrepresentation of African Americans, Hispanic Americans, and Native Americans in member schools’ enrollments and in the ranks of management. In 1968 the University of Rochester became the fourth business school to join the consortium, and we have remained a committed school partner to this organization. This partnership is part of why Simon has such a diverse MBA program. Aside from celebrating this anniversary with the consortium, the annual diversity conference provides opportunities for professional development; leadership panels and speakers; and content for prospective students, current students, alumni, and the community. Simon is dedicated to supporting the student experience through inclusive education. Simon was also ranked as the 13th top MBA program for women in the US by the Financial Times (2018). Simon’s Women’s Conference weekend, November 9–10 this year, provided networking between prospective female candidates and current female students, alumnae, faculty, and administrators, with sessions centered on current issues women face in business. There also were opportunities to discover Simon’s affiliation with the Forté Foundation and the associated benefits, including merit-based fellowships, networking, and career opportunities with designated corporate partners. Empowering women to succeed in business is a top priority at Simon. The Warner School of Education and Human Development had several faculty searches during the 2017–18 academic year. Each search committee was assigned a faculty diversity officer as part of the committee to maximize accountability of the review of applicants. To ensure adequate diversity within the pool of candidates, search chairs also worked with the Office for Faculty Development and Diversity to obtain lists of racially and ethnically diverse candidates who may have been missed through traditional recruitment efforts. At the Warner School, administration coordinated with a team of faculty diversity officers and staff diversity officers to hold a series of forums on sexual harassment. While these forums were focused on sexual harassment, they also allowed for any concerns needing support within the Warner community to be raised and discussed. Among the many diversities to which the University is committed is international diversity. This year, the University’s student body is composed of nearly one-third nondomestic (international) students. In response to the ever-changing national strategy regarding immigration policy, Global Engagement created a new position for an assistant vice provost for international advocacy and engagement. Cary Jensen, former director of international services, began the position on July 1, 2018. The AVP will coordinate services and information for international students, scholars, faculty, and staff across the schools and units. The position also serves as a direct ombudsperson for international students and scholars, including faculty and staff. In addition, Jensen will liaise with the many community groups in the Rochester area dedicated to providing support services for international communities in the region, including Rochester Global Connections, UN Association of Rochester, and the World Affairs Council. Over the last year, the Ain Center for Entrepreneurship has made efforts to involve all students in its cocurricular programming. In order to reach more female entrepreneurs, the Ain Center hosted lectures by two women entrepreneurs. Jeannine Shao Collins ’86 spoke about Girl Starter, her venture that promotes entrepreneurial thinking for young women, and Mattia Gilmartin of New York University spoke at the School of Nursing about entrepreneurship in a female-dominated industry. The Ain Center has also worked closely with Kwetu, a student organization that provides training to entrepreneurs in Africa. Along with Cornell University and Rochester Institute of Technology, the Ain Center provided an I-Corps Node Short Course with a focus on Access Tech—a fundamental tool for those with certain disabilities. Finally, the center also held the Buzz Lab Boot Camp, a training program for rural and urban entrepreneurs. Entrepreneurship students as a whole are a diverse group, and students with varied backgrounds hold leadership positions in entrepreneurship clubs on campus. The Ain Center is proud of the intersectionality the students represent in terms of background, race/ethnicity, age, major, discipline, and school. The Memorial Art Gallery (MAG) is continually seeking opportunities to be welcoming and inclusive of all visitors. MAG’s Mission, Vision and Values statements reflect its strategic approach to making a positive impact on the community and enriching the human experience for all. MAG appreciates and embraces the value of diversity in perspective and unique personal experiences and background and strives to develop programs that attract and serve individuals that historically have not been engaged in museum culture, are disadvantaged, and/or are underrepresented. MAG strives to systematically identify employment candidates who represent its target community and are in protected classes and/or are underrepresented in museum professions. To help close the opportunity gap for these groups, MAG collaborates with community organizations such as Teen Health Success and Partnership Program and BOCES to fill the MAG’s employment pipeline with a diverse pool of candidates. MAG also proactively addresses historical perceptions of exclusivity and elitism by facilitating interaction among people with diverse backgrounds. The Director Shadow Internship was established to counter long-standing barriers to museum access and professions. This unique internship allowed three East High School students to shadow the Memorial Art Gallery’s director for two weeks. The students got a broad view of what and who make a museum work and of the various professional roles one can have in an art museum setting. They met museum guests, patrons, board members, artists, other MAG staff members, professionals from other museums and commercial art galleries, and members of the community. In the past year, Advancement has partnered with Human Resources to offer several dedicated Implicit Bias and Safe Space trainings with active participation, including from senior leadership. One of Advancement’s core values is inclusion, which was highlighted through a new video presentation used both for internal employees and as a recruiting tool. Advancement will work with off-campus partners to bring more offerings on this subject matter and to have more open-ended conversations. The Office of Alumni Relations has actively involved faculty and staff members in alumni engagement programs. Faculty and staff have been highlighted as featured speakers at regional events, partnered in donor cultivation, and attended events as invited guests. 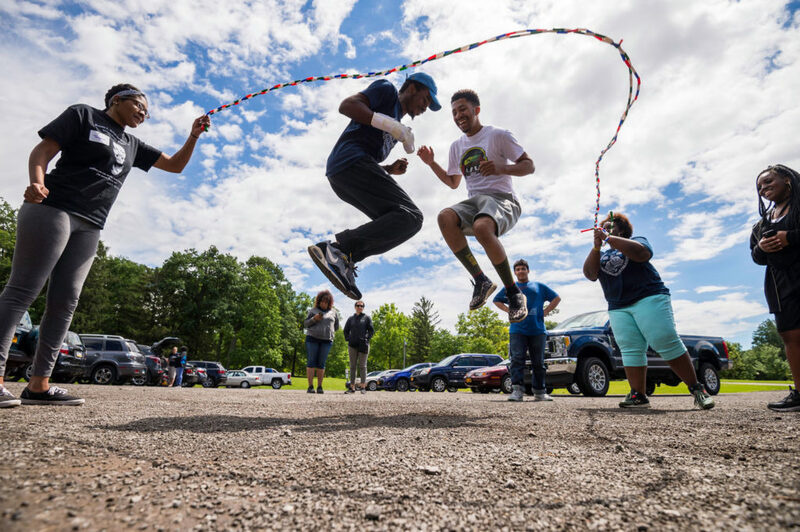 In FY19, events have included Rochester Pride Celebration, A Celebration of Diversity, and several discussions during Meliora Weekend. University Advancement also includes Student Alumni Ambassadors, a diverse group of students who represent the student body as a whole as an integral part of their work. The Student Alumni Ambassadors program introduces student faces to alumni. Additionally, Advancement has worked to include students in alumni events, including those that are culturally based, as appropriate, and hopes to expand these efforts in FY19. Alumni Relations also utilizes student leaders of organizations like Chinese Student Association; College Feminists; Korean American Student Alliance; Black Students Union; Gender, Sexuality, and Women’s Studies Undergraduate Council; and others on the Senior Giving Committee every year to ensure broad representation of diverse student organizations. The River Campus Libraries (RCL) have integrated inclusion into their strategic plan through a diversity, equity, and inclusion lens, from planning to implementation of the Library values and five strategic aims. The UR Libraries Diversity and Inclusion (D&I) Committee hosted a workshop for library staff on unconscious bias. Mark Puente, director of Diversity and Leadership Programs for the Association of Research Libraries, shared his expertise at an all-staff session and led discussions with library leadership at Miner, Sibley, and River Campus Libraries. The inaugural workshop was received favorably, and the committee plans to host diversity, equity, and inclusion discussions regularly throughout the year. Over the last year, RCL directed collection resources toward acquiring diverse collections, including two distinguished archives focusing on women’s rights activism and narratives of the LGBTQ communities. RCL is also developing staff awareness of the role of discovery metadata in promoting diversity and inclusion. They are working to highlight the diversity of our collections with notable exhibits such as a Frederick Douglass exhibit and reading in Rare Books and Special Collections, part of the city-wide celebration of Douglass’s legacy, as well as other Special Collections exhibits, including Queer Territories and Shoulders to Stand On. The River Campus Libraries executed an active diversity recruiting strategy this year. RCL hiring managers attended job fairs at nearby library schools and connected with potential qualified candidates via phone, email, and social media. This effort was successful and has resulted in three library professional staff hires from underrepresented groups. In response to the lack of diversity in academic libraries, the River Campus Libraries began facilitating a Career Exploration in Librarianship and Mentoring program (CEILAM). CEILAM introduces the field of librarianship to students from underrepresented groups. Undergraduate and graduate students from all campuses are encouraged to apply and submit a statement of their commitment to diversity. CEILAM is an opportunity for students to become familiar with the various specializations within the library profession, assist with a library project, and engage with librarians regarding education and career paths. During the spring semester, eight students were hired as library student employees and were assigned a project and a mentor. The River Campus Libraries (RCL) are also actively engaged in retention efforts for staff of color, fully supporting the librarians of color who are participating in the Association of Research Libraries’ Leadership & Career Development Program (LCDP). The LCDP is a yearlong program to prepare midcareer librarians from historically underrepresented racial and ethnic groups to take on leadership roles in their careers and in the profession. Two RCL librarians were selected for the 2018-2019 LCDP cohort. RCL leadership staff of color are supported in their participation in the National Inclusive Excellence Leadership Academy (NIXLA). The Division of Administration and Finance is focused on actively promoting a safe and welcoming environment that fosters an inclusive organizational culture and upholds the value of diversity. At the department level in FY18, initiatives targeted hiring practices, career paths and pipelines, mentorship, celebrating diversity, and opening the lines of communication for employees on issues of diversity and inclusion. To increase the diversity of incoming employees, several departments worked to improve hiring practices by pursuing a diverse candidate pool for open positions in those areas. Half of recent hires in the Department of Public Safety were underrepresented minorities. The Department of Human Resources’ hiring efforts also resulted in the hiring of three underrepresented minority Human Resources Business Partners. To support current employees from underrepresented groups, Administration and Finance departments established individual professional development plans as well as departmental pipeline development, retention, and succession plans. There has also been a focus on supporting individual and team development and learning programs. Finance and the Controller’s Office specifically focused on leadership education, and the Procurement Department has utilized short videos to raise awareness on topics like unconscious bias and race and racism. An emphasis was placed on mentoring employees from underrepresented populations so they have the support, guidance, and resources they need to succeed. The Department of Public Safety appointed two leaders to have the specific responsibility of focusing on diversity issues and a mentorship program. One of these leaders was selected for the Inclusive Climate Leadership Fellowship as a result of this work. Actively mentoring, incorporating individualized discussions about professional development and career enhancement, and ensuring all types of role models are available for employees will be strategies in the upcoming fiscal year to improve upon last year’s progress. The Administration and Finance department also considers the student experience. Campus Dining and Auxiliary Services held focus group meetings with international students and Muslim students to gain a greater understanding of how to make the dining program more open and inviting to those students. In December, Kevin Beckford was hired as the University of Rochester’s first director of Staff Diversity, Equity, and Inclusion (SDEI). The goal of SDEI is to create an effective and safe place for all staff to address concerns of diversity, equity, and inclusion. Over the past year, SDEI has focused on a broad range of staff diversity issues, including recruitment, retention, and promotion; leadership commitment to staff diversity on all campuses; and implementing systems to ensure the University utilizes current “Best Practices” in support of staff diversity, equity, and inclusion. SDEI encompasses three distinct operations: Staff Diversity and Inclusion Operations, Affirmative Action, and Diversity Education. For information about staff demographics, please visit the diversity dashboard. Staff Diversity and Inclusion Operations: SDEI collaborates with all staff, administrators, and departments to create strategies that empower staff to achieve their full potential. These strategies include Affirmative Action, diversity education, job coaching and mentoring, community engagement, and underrepresented minority youth pipeline programming. Affirmative Action: The University of Rochester is subject to a variety of state and federal laws and guidelines addressing equal employment opportunity and affirmative action. At least annually, and as needed, the University conducts a workplace analysis by job group of hiring, promotion, and termination decisions, as well as a utilization analysis to identify potential disparities in recruitment and employment based on race, gender, ability, or veteran status. The University also establishes, where appropriate, specific goals designed to overcome underutilization and takes other actions to address potential concerns evidenced by statistical disparities. Diversity Education: This year’s focus has been on coordinating online training about acknowledging individual differences and providing employees with a common language and tools to avoid creating barriers based on stereotypes. Diversity training has been well documented as a benefit to organizations in creating a framework for communicating and responding to situations within the workplace. As described in the Climate section of this report, this summer the University launched its first mandatory online training focused on implicit bias. These new online trainings are in addition to several in-person trainings that have been continuously available through Human Resources. All of the training opportunities can be found here. Over the last year, the Human Resources Office of Staff Diversity, Equity, and Inclusion has established a Staff Diversity Officers Foundation Committee, which consists of 12 diverse University staff from the Medical Center and River Campus. The mission of the staff diversity officers is to address the need for equitable and inclusive environments and practices across the University, through collaboration with University leadership and staff. The staff diversity officers will focus on historically underrepresented groups, talent acquisition, retention, and professional development. The University Resource Groups (URGs) are volunteer groups that provide opportunities for employees to directly contribute to the University of Rochester’s efforts to effectively support and manage diversity and inclusion. URGs continue to play an active role in furthering the University’s commitment to diversity and inclusion. University resource groups are open to all staff, faculty, and students and continue to serve as a resource to University leadership. A new Deaf and Hard of Hearing group is in development. The Rochester Center for Community Leadership, which operates many diverse programs in the local community and leads AS&E’s efforts at embedding community engagement in credit-bearing courses, is currently leading the institution’s application to receive classification as a community-engaged campus by the Carnegie Foundation for the Advancement of Education. In 2017–18, the Kearns Center collaborated with more than 60 Rochester faculty members in numerous departments. Faculty members hosted student researchers, taught 21 courses for Rochester City School District (RCSD) students in Upward Bound and Upward Bound Math/Science, and presented multiple talks and workshops. The center served more than 2,000 RCSD students through the Upward Bound, Upward Bound Math/Science, and Talent Search precollegiate programs in four high schools. Over the summer, the Kearns Center supported 97 undergraduates from the University of Rochester and other institutions from all over the country in research labs, internships, and classes. Three of the Kearns Center’s precollege scholars at East High School also participated in a science exploration program that saw their scientific contributions sent into space with NASA. The School of Nursing is committed to diversity and inclusion within the community where students, faculty, and staff live, learn, and work. This year, the SON cosponsored Rochester Black Pride, which has an important Lesbian, Gay, Bisexual, Transgender, Questioning, Intersex, and Two-Spirit (LGBTQI2S) focus that celebrates gender and sexual diversity within Rochester’s Black communities. The SON is proud of its roles as an ally in recognizing and supporting the Black LGBTQI2S community’s effort to create anti-racism and anti-oppression environments that affirm not only the diversity of Black sexualities but the richness and diversity of Black culture(s)—all of which are important components of health and positive well-being. The SON is also supporting the development of the National Black Nurses’ Association (NBNA) in the greater Rochester area. 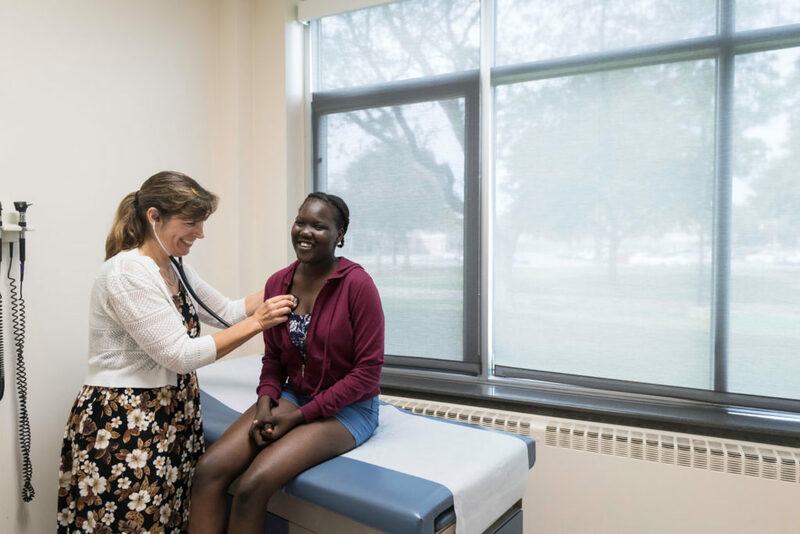 SON’s outreach for the NBNA initiative is not limited to University of Rochester–affiliated nurses and students, but it is open to all nurses and students in Rochester and the surrounding communities. Eastman Institute for Oral Health (EIOH) has been steeped in a tradition of community service since opening in 1917 and is now the largest provider of oral health care to underserved populations in the Rochester region. Studies show that these populations are best accommodated with services provided in the communities where they live. The EIOH considers outreach and partnerships with other community organizations a key factor in reaching and effectively treating this population. EIOH’s affiliations and partnerships include ABC Head Start, Al Sigl Community of Agencies, Highlands at Pittsford, Hillside Children’s Center, Jewish Home, Lifespan, Mary Cariola Children’s Center, Rochester City School District, Rochester Refugee Center, Salvation Army, Special Olympics, St. Ann’s Community, and Volunteers of America. The Simon School student body (with support from staff) has ongoing partnerships with multiple community organizations and each year works to deepen those relationships. Partners include Foodlink and Habitat for Humanity, where Simon was recognized for a 100+ volunteer build day and home dedication. Simon students have also participated in Secret Santa programs with multiple local charities. The Simon Business School and Minority Male Leadership Association also have a mentorship and college prep program with Vertus High School, an all-male charter school in the Rochester City School District. The organization provides monthly programs for 35 senior students at Vertus. In addition, Simon recently created a Board Fellowship Program, which provides internship and project opportunities for students on a local non-profit board. The Eastman School of Music Diversity Committee sponsored a second “PRISM”-style concert at East High School in April 2108, bringing more than two dozen Eastman students to East High School for shared musical performances. This is the third year of interactions with East High School around the topic of diversity of musical experience. The ROCmusic initiative, an after-school music program jointly sponsored by Eastman School of Music and various Rochester partners, has expanded to a second site within the city and continues to enroll students. The Gateways Music Festival, in association with the Eastman School of Music, is one of the programs supported by the Special Opportunities Fund. The festival, which received a substantial grant from the Mellon Foundation in late 2017 to build infrastructure capacity, celebrates the participation and achievement of professional classical musicians of African descent by bringing 125 of the nation’s top solo, chamber music, and orchestral musicians to Rochester each summer for a six-day series of recitals, chamber music performances, and a full orchestra concert. The festival is one of the many ways Eastman expresses its commitment to a rich and diverse musical environment. The Susan B. Anthony Center’s efforts have always extended beyond campus. Last summer, the Susan B. Anthony Center and University student Torrey Wyatt disseminated a survey to assess the needs of the transgender and gender nonconforming population of Western New York. This survey collected information from 134 subjects, and the Susan B. Anthony Center is currently analyzing the findings for dissemination. Some preliminary data were presented at the International Family Violence and Child Victimization Research Conference in July 2018. At the Warner School, the Center for Urban Education Success (CUES) was created to support the success of K–12 urban schools. Grounded in the University’s partnership with Rochester’s East High School, CUES brings together the Warner School’s educational programs, community outreach, and research about urban schools and the University’s work at East. The center’s goal is to expand opportunities to apply quality research-based solutions at East and to leverage the knowledge gained at East to achieve greater reach in the revitalization of K–12 urban education nationally. This year, CUES received a significant gift from the Konar Foundation to create a new endowed directorship position to lead CUES. Shaun Nelms, superintendent of East Upper and Lower Schools in Rochester and formerly an affiliated faculty member of CUES, was installed as the inaugural director to fill this endowed position. This gift allows Warner to continue demonstrating its commitment to supporting the academic success and well-being of students in urban communities and sharing its process with other schools and districts. In order to build a pipeline of diverse talent in the Rochester area, University IT sponsors college and high-school internship programs. The high-school internship program is run in collaboration with the Rochester City School District and the Hillside Work-Scholarship Program. Over the years, University IT has mentored 14 high-school students through the program, with several students completing multiple internships. One of our students is still working in University IT as an IT merchandiser in the UR Tech Store; another is a Monroe County deputy sheriff. University IT welcomed three high-school students in the summer of 2018. 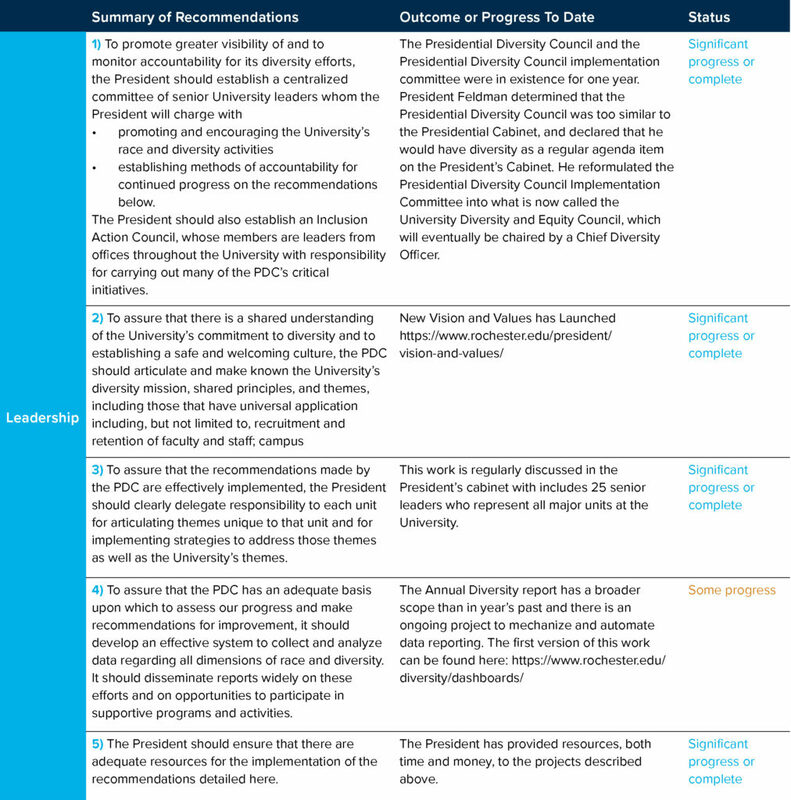 To successfully implement sustainable change, the University must be resolute in continuing to identify and address the diversity, equity, and inclusion challenges within the organization. To have meaningful impact, all members of the community will be expected to understand and encouraged to champion the University’s Vision and Values Statement. 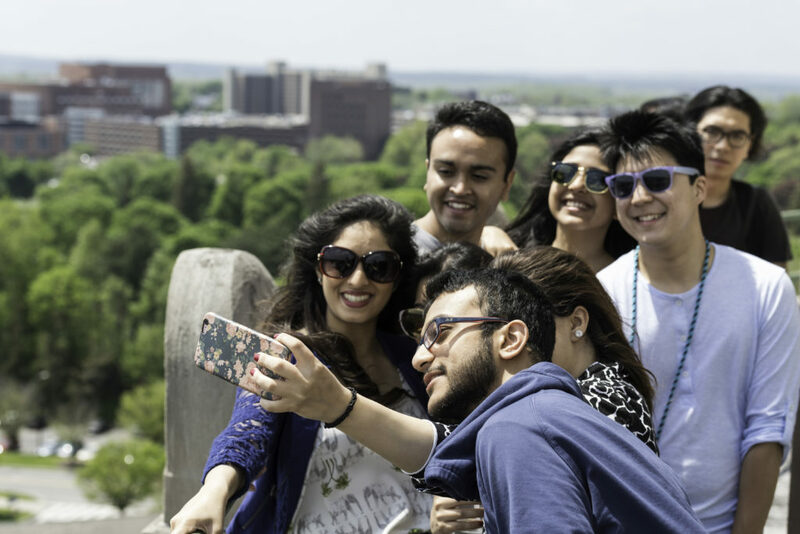 From senior leaders to staff and faculty to students, each individual must ensure that the University of Rochester welcomes, includes, and values everyone. There are many opportunities for continued improvement. Recruitment and retention of a more diverse staff, faculty, and student body in all schools and departments must continue to be a priority. Training and education on unconscious bias and cultural literacy are also going to be critical as the University continues to embrace a more inclusive and diverse environment. We anticipate substantial progress in the coming year as we move toward creating a new central office for diversity, equity, and inclusion. The appendices that follow include more specifics about events and awards that occurred this year, and also are a comprehensive accounting of the work that has been done on the recommendations from the Commission on Race and Diversity. While we have addressed many of the recommendations, the gaps that remain will be addressed in the coming year, and will create a direction for activities as the University moves towards a new central office for diversity, equity, and inclusion. Established in 2010, the Presidential Diversity Award recognizes the accomplishments of members of the University of Rochester community who contribute to diversity and inclusion through exemplary leadership. Community members from all facets of the University, including faculty, staff, students, units, departments, and teams, are eligible to be nominated. Past recipients and nominees have demonstrated a commitment to diversity and inclusion through recruitment and retention efforts, teaching, research, multicultural programming, cultural competency, and community outreach initiatives. The recipients of the 2018 Presidential Diversity Award were Jonathan Wetherbee ’08, School of Nursing Staff Diversity Officer, and Molly Murdock, doctoral student at the Eastman School of Music. 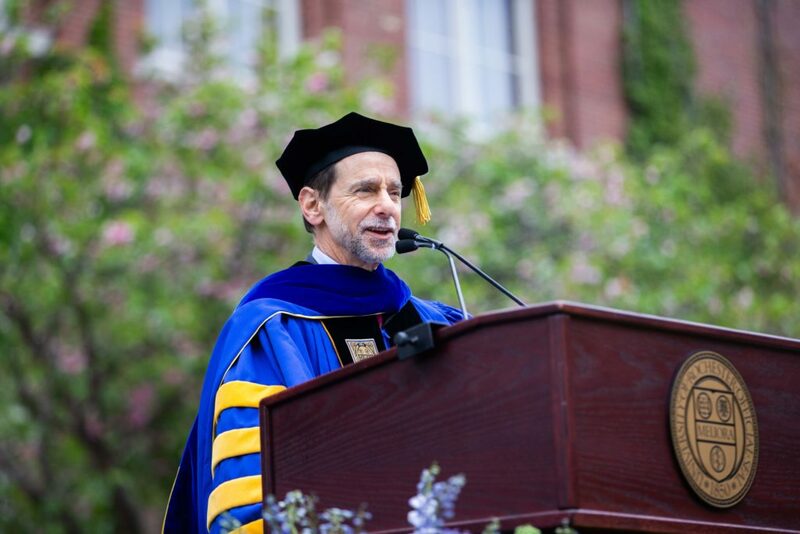 Throughout his 10-year career at the University, Wetherbee has taken on an ever-increasing leadership role in a number of programs and initiatives supporting respect and dignity for all people. Murdock is an advocate for gender equity in music performance and scholarship. Recognizing the lack of female composers being taught in music classes at all education levels, she collaborated with like-minded students at the Eastman School of Music and other institutions to create a website, Music Theory Examples by Women, to highlight music created by women. She also uses social media platforms to promote dialogue surrounding gender and racial equity in music. The Susan B. Anthony Legacy Awards are a 60-year tradition honoring exceptional women in the University of Rochester community. This year, seven exceptional undergraduate women were presented with awards. Andrea Holland, a motivational speaker and communications coach, delivered the keynote address. Additionally, a new award, the Susan B. Anthony Center Community Champion Award, was presented to the organizers of the VoteTilla event that celebrated the centennial of New York women’s voting rights. VoteTilla was a week-long navigational celebrating 100 years of women’s voices and votes in New York State that took place along the Erie Canal and ended with a weekend celebration in Rochester, July 17–23, 2017. With a core of five rented canal boats, VoteTilla set out from Seneca Falls, New York, and traveled to Rochester and finished the journey with a parade to the National Susan B. Anthony Museum & House and celebrations around town. The Eastman School of Music recently established the Eastman Diversity Award. In 2018, procedures were developed; nominations were solicited from faculty, staff, and students, including the Eastman Community Music School; and a sub-committee was formed to select the first recipient. The inaugural award was presented to Elizabeth West Marvin, professor of music theory. When the Eastman Diversity Committee was formed in 2007–2008, Marvin was one of the first faculty members to join the effort to establish a vision and an action plan that would address diversity and inclusion at Eastman. She subsequently chaired this committee and helped to create a strategic plan that continues to guide the school’s diversity agenda today. Among the accomplishments from this plan include the addition of a diversity statement to the Eastman mission statement; the expanded training for search committees to identify diverse candidates; and the creation of the Eastman Departmental Diversity Initiative (EDDI). Betsy Marvin was presented this inaugural Diversity Award in recognition of her sustained commitment to diversity and equity throughout her years on the Eastman faculty. Established in 2013, the University of Rochester School of Medicine and Dentistry Faculty Diversity Award recognizes the exceptional contributions and accomplishments of medical school faculty to fostering a diverse and inclusive medical school community. The 2017 recipient was Catherine (Kate) Cerulli, director, Susan B. Anthony Center, and associate professor of psychiatry, School of Medicine and Dentistry. Cerulli was recognized for her exceptional contributions and accomplishments in fostering a diverse and inclusive medical school community. Established in 2007, the Mary Dombeck Diversity Enhancement Awards recognize faculty and staff members at the School of Nursing (SON) who have demonstrated a significant commitment to enhancing diversity at SON, and who have created and implemented diversity and inclusiveness action plans. The 2017 recipient was Yvette Conyers, RN, MSN, FNP-C, CTN-B, instructor of clinical nursing. Conyers is a member of the school’s diversity council and a founding member of the LIFT program. She was also recently appointed the Medical Center’s representative to the Structural Racism Project for Agencies, sponsored by St. Joseph’s Neighborhood Center and Catholic Family Center. Other events included the Dale Carnegie Professional Development Session; the Diversity Leadership panel; and a Simon Social with Panel, Alumni, and Current Students. The panel discussion that followed featured Dr. Scott; the Honorable Teresa D. Johnson, Rochester City Court Judge; and the Honorable Jenean Hampton ’03S (MBA), lieutenant governor of Kentucky. The panel was moderated by Purdue University political science professor Valeria Sinclair-Chapman, PhD. Bennett’s lecture focused on her recent novel, The Mothers, an emotionally perceptive story about community, love, and ambition. She examined the roles demanded of young black women and men and the hypocrisy sometimes inherent in their community’s expectations. Mariah Gladstone explained the path to Native American sign language revitalization—and how securing a future for the first universal sign language secures a future for Native youth, strengthens cultural redevelopment, and builds exchange across the United States. The year 2018 marks the 200th anniversary of one of our nation’s heroes: Frederick Douglass. He did the most important work of his life in Rochester, so there is nowhere better to celebrate his contributions to our nation as well as to our city. This event was an opportunity to bring Rochester and the University community together in an effort to focus our energies on community engagement and to remind us of the richness and power of our community’s diversity. Gabriel-Joseph examined the idea of citizenship through the life of Pierre Toussaint, an enslaved man from Saint-Domingue who arrived in New York City as part of the household of Jean Bérard, a French planter fleeing the Haitian Revolution. In addition to her graduate student and faculty presentation, Wiener also facilitated another conversation with students and administrators on disability advocacy. Keynote Speaker: Kenneth B. Morris Jr.
Kenneth B. Morris Jr. is the great-great-great-grandson of Frederick Douglass and the great-great-grandson of Booker T. Washington. Morris gave a presentation about the history of his family, the pressure he felt growing up in the shadow of his esteemed ancestors, and his work today fighting against modern slavery as president of Frederick Douglass Family Initiatives. This one-day Transgender Health and Wellness conference educated physicians, medical providers, and the community about how to offer welcoming and affirming health care to transgender individuals. Bianca Williams is a black feminist cultural anthropologist who focuses on topics related to race, gender, and activism, including black feminist leadership and pedagogy, most recently in the Black Lives Matter movement.